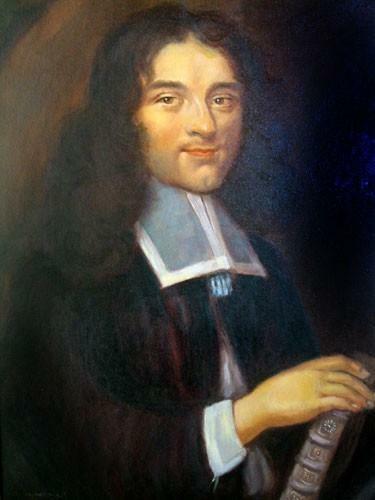 Pierre Bayle can be seen as a forerunner of the Age of Enlightenment because the concept of tolerance was of great importance to him and, a true scholar, he specialized in historical criticism. 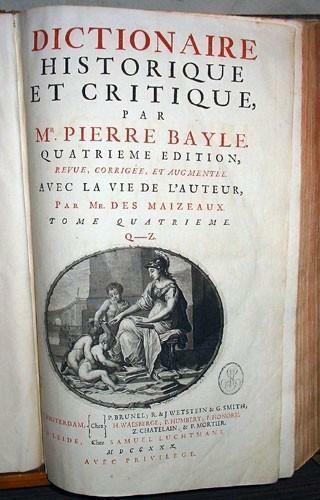 Pierre Bayle, whose father was a pastor, was born in Carla in the county of Foix (Ariège). He converted to Catholicism when he was at the Jesuit college of Toulouse. In 1670, having obtained his diploma of Bachelor of Arts, he left Toulouse and abjured Catholicism. As he was considered to be a heretic by the catholic church, he had to leave the country, so he fled to Geneva, where he started studying theology. This is how Pierre Bayle described his return to Calvinism (told in the third person). « He was very mistrusting of the exorbitant worship of « Creatures » because his study of philosophy enabled him to understand that the credibility of the theory of transubstantiation was non-existent and he realised that the objections he had previously were largely dictated by Sophism. When he analyzed the two religions anew, he found the true light again which had been hidden from view and decided to follow it once more, caring nothing for the thousands of material advantages he would have to do without, nor for the thousand troubles he knew he would incur in choosing this, the true belief ». In 1675, he was a private tutor to several reformed families in Rouen and Paris, then he succeeded in the competitive exam to become Professor of philosophy in the reformed Academy of Sedan. When this Academy was abolished in 1681, he fled to Rotterdam in the United Provinces, where he taught philosophy and history in the Ecole Illustre until 1693. At this time, the United Provinces were a sovereign state which had a highly successful economy and a rich cultural life. Much French was spoken, due to the arrival of many Walloons, who had fled from the south of the Low Countries, which were cruelly enthralled by Spain. The well known Dutch printers ran a thriving business – as a result there was a great deal of literary activity in Holland. Their newspapers and gazettes were circulated throughout Europe. Pierre Bayle was the main editor of one of the most famous of the literary periodicals : News from the Republic of Letters, from 1684 to 1687 – this put him in touch with scholars all over Europe. A dictionary of historical criticism, 1696 – 1697, this was a critical examination of dogmas and traditions. This dictionary, which combined both scholarship and analytical reasoning, was highly successful in literary Europe – unfortunately it was banned in France. Bayle, an enemy of sectarianism, argued in favour of tolerance so that everyone could be free to follow the religion of their choice. He believed that loyalty to the crown was the key to achieving tolerance in France. His idea of tolerance was based on the respect of other people’s personal beliefs. These could, of course, be quite varied, so, according to him, it would be quite illogical and wrong to persecute someone for being a heretic. His political standpoint and his defense of the right to think differently from others led to a violent controversy with Pierre Jurieu, who was also a refugee in Rotterdam. He died in Rotterdam in 1706.